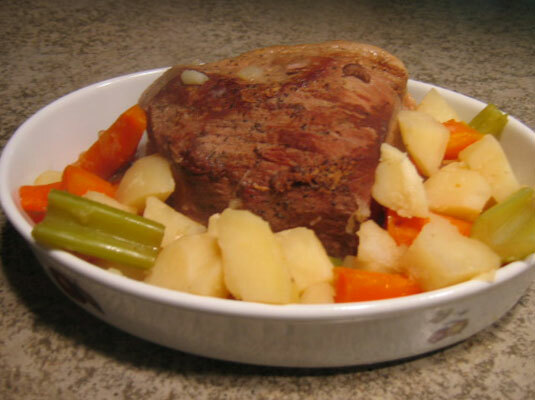 Beef pot roast gets a bad rap as being tough, dry, and stringy. This recipe gives you the secret to a tender, fall-apart-at-the-touch-of-a-fork pot roast. First, select a roast that has consistent marbling. Second, braise it for a long time at a low temperature. Rub the roast with salt, pepper, and garlic salt. Heat the oil in a 5- or 7-quart cast-iron Dutch oven on medium high or high. Sear the roast on all sides until it’s very brown. Add enough water to almost cover the roast and add bouillon cubes. Cut the celery into 2-inch pieces. Add 1 of the quartered onions, the celery, the bay leaf, and 1 tablespoon parsley to the Dutch oven. Simmer for 2 or 2 1/2 hours. Peel the carrots and cut them into 2-inch pieces. Add the carrots and the remainder of onions to the Dutch oven. Reduce heat and simmer for 30 more minutes. Peel and halve the potatoes. Add the potatoes to the Dutch oven. Reduce heat and simmer until potatoes are fork tender, about 30 minutes. Use spatulas to remove the roast to a large serving platter. It’ll be so tender that it may fall apart. Pile the vegetables on and around roast. Strain the broth and reserve for making gravy or freezing for later use. Per serving: Calories 351 (From fat 102); Fat 11g (Saturated 4g); Cholesterol 119mg; Sodium 357mg; Carbohydrate 19g (Dietary fiber 3g); Protein 41g.